Dr. Kamau-Rutenberg is the Executive Director for African Women in Agricultural Research and Development (AWARD). Prior to joining AWARD, Dr. Kamau-Rutenberg founded and served as Executive Director of Akili Dada, an award-winning leadership incubator that invests in high-achieving young women from under-resourced families, who are passionate about driving change in their communities. Wanjiru also served as an assistant professor of Politics at the University of San Francisco and a lecturer in International Relations at Hekima College, a constituent college of the Catholic University of Eastern Africa. Her academic research and teaching interests centered on African politics, gender, international relations, ethnicity, and democratization, and the role of technology in social activism. Dr. Kamau-Rutenberg has received widespread recognition for her work investing in women, including being honored as a White House Champion of Change, named one of the 100 Most Influential Africans by New African magazine, recognized as a Ford Foundation Champion of Democracy, awarded the United Nations Intercultural Innovation Award, and named one of Kenya’s Top 40 Women Under Age 40 among others. She is a member of the Malabo Montpellier Panel, a high-level panel of independent experts that supports African governments and civil society identify and implement policies that enhance agriculture, food and nutrition security across the continent. Kamau-Rutenberg also sits on the Board of Twaweza, East Africa’s largest public and policy engagement platform, and the African Democratic Institute, which works to enhance democratic values across the continent. 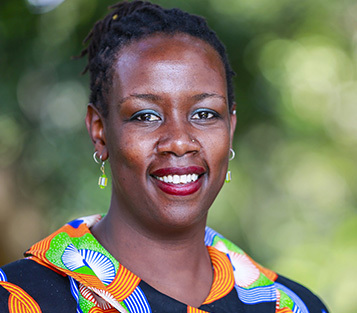 Born in Kenya, Wanjiru holds a PhD and a master’s degree in Political Science from the University of Minnesota, and a BA in Politics from Whitman College, Washington, U.S.A.